Ice Fishing is an amazing form of fishing that everybody chases. One of the most important concerns of fishing in the ice is Ice Fishing Rod which can improve your fishing experience and can also get your score so down that fishing will seem not more fun at all. Traditional Ice Fishing Rods have gone through countless updates and developments over the past several years for making them more secure, safer and efficient to use. But which Ice Fishing Rod are you going to select? What should be your concern while choosing the ultimate ice fishing rod for you that suits your other equipment for fishing? The selection depends on some basic facts such as the power of the rod, particular species that you are going to fish, the building material etc. Let us now go to a deeper section and discuss the mandatory features that will make you choose one specific rod. 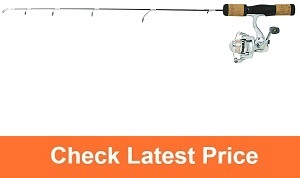 Let us aid you in this selection of Ice Fishing Rod. Buyer’s Guide: Things To Consider Before Buying Ice Rod! If you are looking for a high performing combination ice rod for your fishing, you should choose the Berkley lightning Ice Rod. 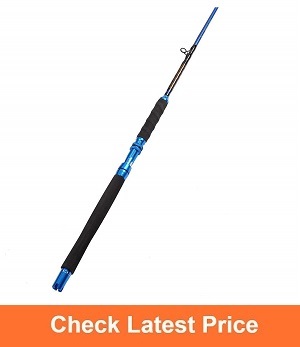 This ice fishing rod is designed with over sized guides that are durable, lightweight, and thread the fishing line perfectly. It has a ball bearing drive and a graphite spinning reel for easy casting. This rod is comfortable and incredibly light due to cork grip over the fiberglass that performs nice touch. The Shakespear Ugly Stik ice fishing rod designed with an EVA and fully ergonomic that is highly comfortable to grip and reel from. It comes with a combo in which reel has a twist lock so that added extra security for fishing. One piece stainless steel guides included into the pole which also adds durability and security. Anglers will be able to identify the nibblers quickly and enjoy a long period of durability with this fishing rod. Specially designed for ice fishing. Fiblink Graphite Ice Fishing Rod comes in two different sizes, 24 inches light power rod and 30-inch medium power rod. This Fiblink is a high-performance rod that is designed to be well-balanced, light-weight, strong, and sensitive. This ice rod is made of graphite, so it is not only lightweight but also built for strength and durability. This rod also includes an excellent feature with the guides of aluminum oxide, which make the rod more durable and lighter. 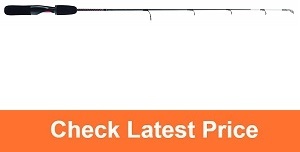 The master fishing tackle brush spinning rod is a high-quality ice fishing rod and reel. It has the great value for the money. Specially designed with safety and high performance in mind. It comes in several colors which include pink, red, green, and blue. The entire ice rod is very lightweight and comfortable 2 feet long. It is a great combo for beginner anglers as well. If you are searching for some benefits like durability, efficiency, and convenience from your ice fishing rod you should choose the Frabill Fin-s pro Ice fishing rod. but it included solid carbon fiber blank which is not only stronger and lighter but also increased sensitivity as well. This ice fishing rod has special stainless steel with unique foot ice guides. It also included a fishing reel seat with cork grip. Construction material is the foremost and the basic factor that should be in your list while selection an ice fishing rod for you. This is so much crucial because this can mean the difference between losing a fish and landing it, so you have to be very careful when it comes to choosing a material. You are already aware that there are of a lot of fish which can put up a very formidable fight on getting hooked. You should never think to take fish as your friend and remember not to consider enemies to be weak. Fish are not weak and they will definitely fight for their life. From both the ends of the fishing line, the fishing rod must endure the relentless strain that will be exerted on it. 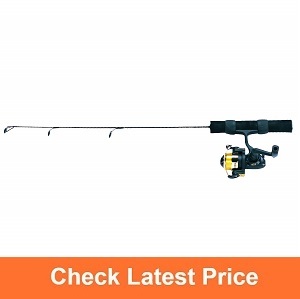 So for you, it will be an ideal choice if you select a fishing rod that is made of a tough and sturdy material which is capable of withstanding the forces and power that will be exerted on the rod. With regards to different fishing rod materials, we would like to create two main selections between graphite and fiberglass. Both of these materials stand up with unique and mutually impressive advantages. Graphite as a material for ice fishing rod is frequently seen to be more responsive towards its job. It is enough lighter and for this reason, it is one of the most expensive materials in fishing rod world. Most of the fishing rods these days are seen to be constructed with fiberglass. This material has higher durability which you will chase if you go to ice fishing on a regular basis. The flexibility skill of this material is commendable. As we are talking about ice fishing, we must mention that fiberglass is not too much sensitive to cold. Occasionally, you mag g through a fishing rod that is constructed with carbon fiber and stands in the top-notch fishing rod products. Not only strong, sturdy and light, but this specific material is also highly durable and sensitive too. These all features make the fishing rods made of Carbon Fiber more expensive than the rods of fiberglass and graphite. You have to understand that there are different rods in the market for different reasons. Species of fish is a crucially important fact that you will have to come across if you want the best ice fishing rod for your amazing fishing days. There is no all-in-all! Every rod will not provide the exact same facilities, there will be the difference in facilities in different rods. Every rod cannot catch every species that you have targeted. One rod can never land them all and so it is prominent for you to be well informed about certain species of fish that your fishing rod is capable of catching. There are various power levels that are available in the market which will suit only particular species. For example, if you want fairly sizeable specimens just like lake trout or pike then you have to consider the heavier rods. And if you are up for species like panfish then an ultra-lightweight fishing rod will be your best bet. Rods required while fishing in the ice can be split into several categories that depend on the strength level the bear. The popular categories are heavy, medium, light and ultra-light. Fishing rod, in general, comes with descriptions that describe the power of the rod which tells you how perfectly the rod can endure pressure just before starting to bend. This power also depends on the fish you select to fish in your selected water body. Heavier rods works smoothly when it comes to bigger and heavier fish species just like the lake trout or pike. These rods are usually used when you are fishing in a water body where you are going to fish smaller fish than pike. The light and ultra-light are for the small fishes like panfish. How can I handle and test my fishing rod? If you want to test your rod then you have to go to the store and check it properly. The bail is the concern and so check it and play with it so that you can get to know how perfectly and smoothly it works. Do not forget to check the drag handle and the fishing reel handle. You have to ensure that the rod is not noisy. Rod power is the measurement of the weight the rod can hold. The rod powers depend on the object(fish) that sticks with the handle. Heavier fish require higher rod power, smaller fish require lighter rod power. Why should I pick up a well-balanced rod? The total balance of the rod with the line balance is very important. 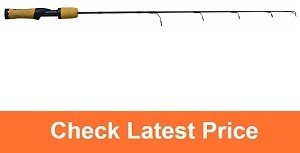 Select something that is not excessive flexible and has a strong tip so that it can boost up the balance of the rod. Nevertheless, with the enormous advancements and developments which have gone into the production of these fishing rods in recent years, it will be really complicated to come up with one ideal choice. For simplifying this messed up the situation, you have to think yourself to be an individual angler and have to shape up your own requirements that will suit best for you. Just like the aforementioned basic features, go through them and all you have to do is narrow down the fishing rod field considerably. Is it winter now? Go fishing in the ice because you deserve adventure.